A photo of a late 442nd Regimental Combat Team member and his buddies has been returned to the veteran's family after the photo was stolen during a chaotic estate sale Saturday. "It really means a lot that they brought it back," said Faith Minyard, the daughter of the late Russell Shigeru Takashima, whose photo of himself and his buddies in Company K had been taken from his Kahului home. Minyard said on Wednesday that her daughter, Delisha, saw a trash bag on her late father's yard Wednesday morning. This photo of Russell Shigeru Takashima and his 442nd RCT is safely back in the family home in Kahului. The photo was taken from an estate sale Saturday and was returned to the family. Minyard said she went to pick up the bag that was near the mailbox. When Minyard opened up the bag, she remembers saying, "Oh my gosh, it's the picture, it's the picture." She said the back of the photo was a little torn, as the photo, which was in a frame, got wet from Wednesday's showers in Kahului. She said there was no note attached to the bag. The family had an estate sale Saturday at Takashima's home. The family said the sale was chaotic, with 40 to 50 people rushing into the home and rummaging through rooms they were not supposed to be in, including the one that had the photograph on the wall. After Saturday's sale, the photo was missing. The family searched for the photo but couldn't find it. A witness reported seeing a man take the photo off the wall but did not see what he did with it. Because of the incident, the family canceled Sunday's planned sale and will donate the items. Minyard said the photo is of her father and Company K while they were at Camp Shelby in Mississippi before leaving for Europe. 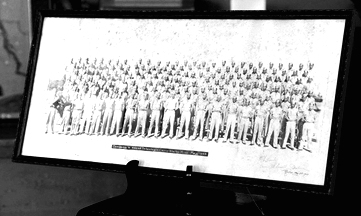 She said the photo is also signed by about 50 of the men in the photo. "A lot of his good friends had died in the war. This picture is like their last picture all together. It really means a lot they brought it back," Minyard said. Takashima last year was awarded a Congressional Gold Medal of Freedom along with his fellow nisei warriors of the 100th Battalion/442nd RCT and the MIS. He also received a Purple Heart and a Bronze Star Medal. He died August 17, 2012. He was 90.